The forest began only a few hundred metres from our guest house. 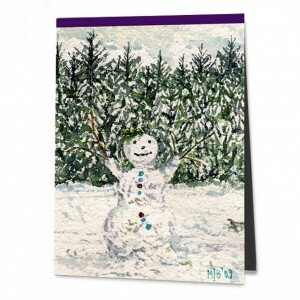 There I discovered this funny snowman with his wide-outstretched arms and brightly-coloured coat buttons – just the right motif for my first winter painting. While my husband and son, who at the time was still small and not used to the snow, were pulling the toboggan along to the run, I plonked myself down in front of the snowman and began to paint. It was a cold, but sunny winter’s day, the sky was a cloudless blue. Due to the cold, the paint dried only very slowly on the paper. While I was waiting to make my next brushstroke, I tried to warm my fingers. They had quickly become stiff and dead. Compared to how I dress in Berlin I had plenty of layers, but not enough for sitting in one place. The cold crept through my body and when the picture was finished I felt stiff and frozen. I did not look as jolly as my snowman, but somewhat appalled to be in this scene. The cold was everything, I could hardly feel my body, feeling had been encompassed by a coat of ice. Did I still have feet? Would I still be able to move at all? I did and I could, but only slowly. So, I shoved everything I had with me into my rucksack, said farewell to my snowman and turned back to the guest house. It was only when I thawed out in the bath that my spirits were revived. And when my body temperature was back to normal, I could even smile again.